. : Craftsbury TD Bank Eastern Cup, Day 2 - Skate Short Distance :: Ski XCOttawa.ca :: Skiing in Ottawa and Gatineau Park :. Day 1 of the Eastern Cup close out quite nicely with some impressive results from Team XC Ottawa. 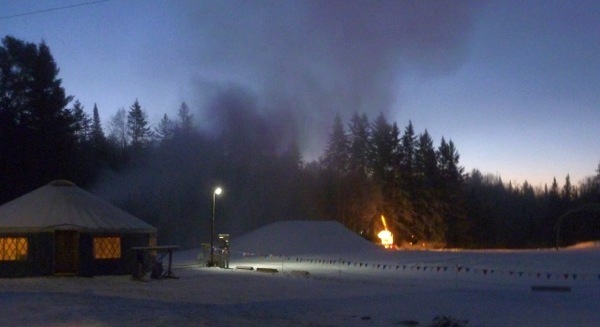 Luckily, the temperature that evening dropped significantly and allowed for lots of snow making, in hopes of shaping up the perfect skate course. The event organizers started making the snow early in the evening and pushed right on through the entire night, until early morning. Big shout out to those guys who made it happen! Meanwhile, we either got to stay in our warm fire lit cabins or enjoy great food at the dining lodge. 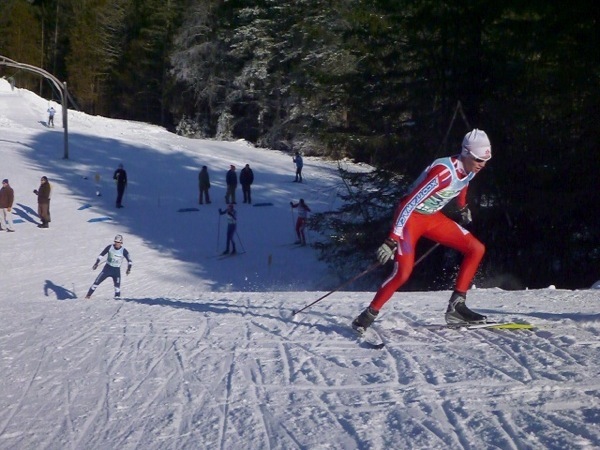 The Craftsbury Nordic Centre is a awesome place to train and race. The food the lodge provides is super tasty, nutritious, and full of good energy for elite athletes. I must also mention, that being able to race directly out of your front door is unbeatable and makes race days pretty relaxing. Despite the 3 extremely hard physical efforts, it was pretty much the sweetest vacation! In to Day 2, we have the snow guns still firing full tilt at 6am. This was Craig's (our WaxTech/Coach) first view of the morning. Another big up to him for all the work he put in this weekend! The rest of the team rolled out of bed much later to a beautiful blue sunny sky and crisp cold air. My kinda day for a ski race! Up first in the morning was the Women's 5km event (3 laps). The approx 1.5km loop, as expected, was bomber fast after lots of grooming work and cold temps. XC Ottawa Women posted some fast times and more stellar results. Notable finish was Megan McTavish who placed 6th overall and less than 3 seconds from the podium and prize money! Megan mentioned that her tactics were similar to yesterdays prologue, except this time she held her sprint race pace for 3 laps and not 2. Impressive. After the 160 Women finished up their race it was time for the Men to start their 10km skate event (6 laps). By now the course was really skied in and only continued to get faster, with a few sugary sections. Over 200 Men started today's race and with 6 laps a piece, at 30s intervals, it tended to be pretty busy out there. All of the Men had good performances and are showing promising futures for this coming race season. However, XC Ottawa's latest star, little Lee Hawkings stood among us and continued to show a dominant force in the deep field. 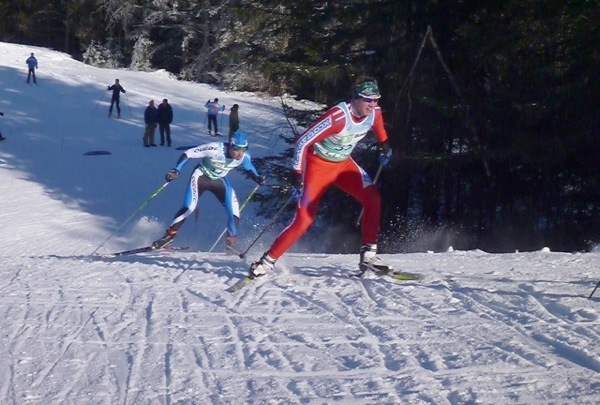 He placed 20th overall (top Canadian) to finish up a killer weekend of races! Megan about to overtake one of many! Vesta finishing up her last lap with lots of power! Kyle trying to dig deep on the course steep hill. The one and only Lee "The Blackhorse" Hawkings showing nothing but smiles! Peter pumping the jam! Note, the ankle coverage this year. Shout out to Podium Wear for putting some extensions on this guys race bottoms. Megan and Katie having a great time cheering on the guys! And that wraps up the weekend of racing in C-bury! .... Or does it? Stay tuned for Part 2 of this article which includes the journey home... The "Prev" rumors you all may be hearing may or may not be true. Check back by weeks end! Race Report: Ontario Cup #4 Report - Alana's Revenge!